WASHINGTON ““ Opposition to a proposed Israeli conversion bill is mounting, from the U.S. Congress to the Israeli prime minister. Meanwhile, the bill is likely to be put on hold while the Knesset adjourns this week for a two-month recess. The controversy over the bill erupted last week when its main sponsor, David Rotem of the Yisrael Beiteinu Party, unexpectedly put it to a committee vote. The measure passed by a 5-4 margin, sending it to the full Knesset. Meant to give would-be converts more leeway in choosing where and how to convert in Israel, the bill also would consolidate control over conversions under the office of the Israeli Chief Rabbinate. Non-Orthodox diaspora Jewish movements and the leadership of the Jewish Federations of North America and Jewish Agency for Israel all have warned that non-Orthodox converts would be put at risk of being disqualified as Jews by the Orthodox-dominated Chief Rabbinate. In recent days, a Jewish U.S. senator unhappy about the bill, Sen. Ron Wyden (D-Ore.), began circulating a letter asking fellow lawmakers to join him in condemning the controversial Israeli measure. Wyden’s letter is circulating among the Senate’s 13 Jewish lawmakers for more signatures before it is delivered to Israel’s ambassador to the United States, Michael Oren. Meanwhile, in Israel, Prime Minister Benjamin Netanyahu said he opposes the bill in its current form. The bill “could tear apart the Jewish people,” Netanyahu told his cabinet on Sunday. Following its passage last week by the Knesset’s Law, Constitution, and Justice Committee, the bill must pass three readings in the Knesset for it to become law. The prime minister said he would try to remove the bill by consensus, but if that fails he will ask members of his Likud Party and other coalition members to oppose it in the Knesset. With the Knesset on the cusp of a long recess, the bill is unlikely to come up for another vote until the fall. Rotem says the bill aims to simplify the conversion process, empowering local Israeli community rabbis to perform conversions and thereby make it easier for Israelis to convert – including those who don’t intend to adhere to Orthodox observance. But in giving the Chief Rabbinate ultimate authority over conversions, the bill puts non-Orthodox converts at risk and may make it more difficult for non-Orthodox converts to make aliyah, critics in the diaspora warn. Rotem says the bill should not concern diaspora Jews. Shas Party Chairman Eli Yishai, a member of Netanyahu’s coalition government, said he supports the bill. “The absence of a conversion law is the greatest spiritual danger for the people of Israel at this time,” he told Ynet. The chorus of American voices against the bill is growing, particularly in the Conservative and Reform movements, whose members make up most of American Jewry but have only a small presence in Israel. Opponents are concerned by the bill’s clause that converts will be recognized as Jews only if they “accepted the Torah and the commandments in accordance with halacha,” which could exclude some converts from being eligible to obtain Israeli citizenship under the Law of Return because they would not be considered Jews by Israel. Rabbi Julie Schonfeld, executive vice president of the Conservative movement’s Rabbinical Assembly, wrote an open letter to Netanyahu explaining why the bill will divide the Jewish community. “The way to really ‘solve this problem’ is to have options for multiple streams and for the indigenous Israeli expressions that will only flower in a non-coercive system,” she wrote. The Jewish Federations of North America said it supports the U.S. Senate letter opposing the Israeli bill. “We welcome any expression of commitment from influential Jews to maintain the unity of the Jewish people and the dangers posed by this divisive legislation,” said William Daroff, vice president for public policy and director of JFNA’s Washington office. In Washington, U.S. Sens. 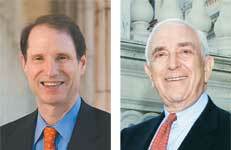 Frank Lautenberg (D-N.J.) and Carl Levin (D-Mich.) have signed the Wyden letter. “I am troubled by a proposal which I believe would make it more difficult for many people who want to convert to Judaism to do so,” Levin told JTA. The letter’s text has not been made public. Jewish members of the U.S. House of Representatives also have expressed support for Wyden’s letter. Rep. Nita Lowey (D-N.Y.), chairwoman of the State and Foreign Operations subcommittee that oversees the State Department and international programs, left a message for Netanyahu and spoke directly to Oren to voice her objection to the bill.